In the never-ending stream of bad news about bad art and worse design comes this little peek into modern hotel hell from Trendsetters.com - Hot Trends, Cool Things, a site which approves of ugliness in the name of trend. "The hot art market is behind the art hotel phenomenon. 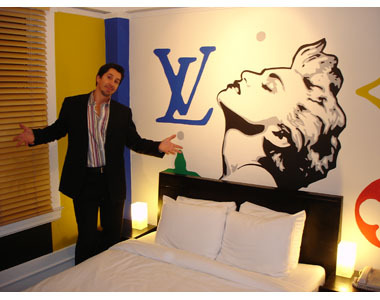 Here San Francisco artist Tim Gaskin shows off his Hotel Des Arts room." Bad logoesque supergraphics from the 70s? A giant stencil of Madonna? A very small and cheap room with a lot of trashy walls slapped with primary colors to get it to seem even smaller? Cost-Plus wooden blinds? Cheap little bedside reading lamps? A cheaper little bud vase? The only thing worse than being drugged into unconsciousness and then waking up in this room would be to wake up in this room with Gaskin still in it. Ai-e-e-e! OK, after Al Gonzales shows "Sideways" to the hajis at Gitmo, what's say we blindfold 'em and relocate 'em to Hotel Des Arts?